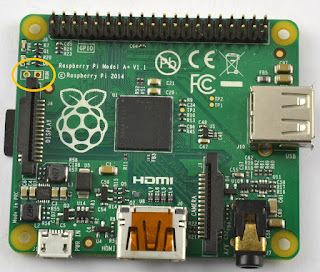 When you gave finished using your Raspberry Pi, you should really shut it down, otherwise, its possible to corrupt the SD card image which would mean you having to reinstall Raspbian. 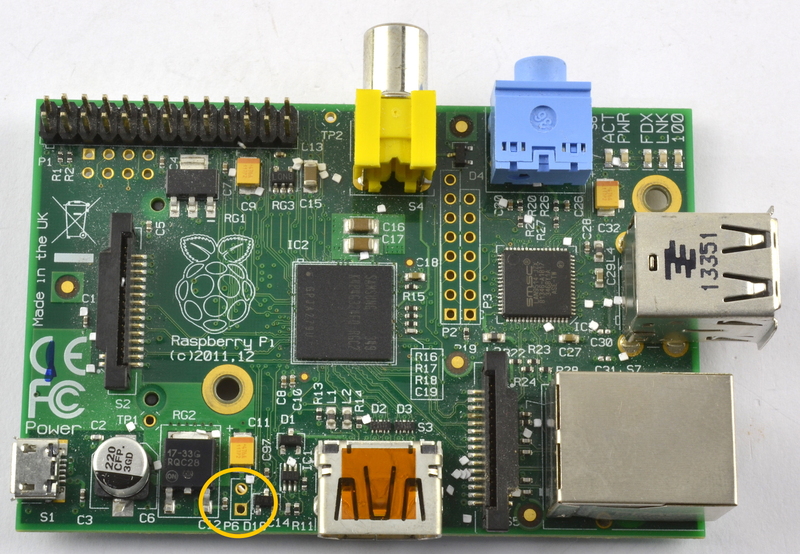 Having shut-down your Raspberry Pi you can get it to boot up again by unplugging and plugging the USB lead, but a neater solution is to add a reset button to your Raspberry Pi. 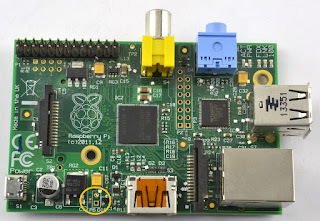 Most models of Raspberry Pi have a connector just for this purpose. * A push button with female header connectors. For the push button, you can either use a scavenged reset switch from an old PC, or, as I have here, a MonkMakes Button, which is sold as a twin-pack on Amazon.com or Amazon.co.uk. 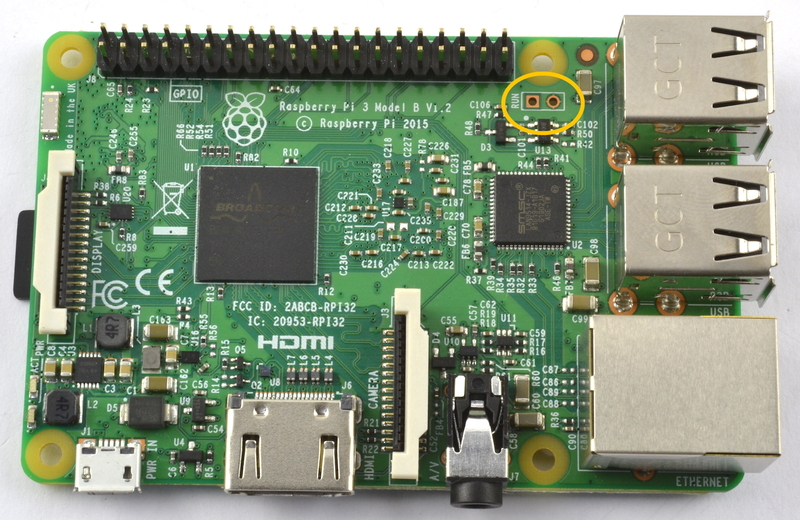 Then push the header pin through from the underside of the board and push the header sockets of the MonkMakes Button into the header pins so that the Pi is the filling in a header sandwich. 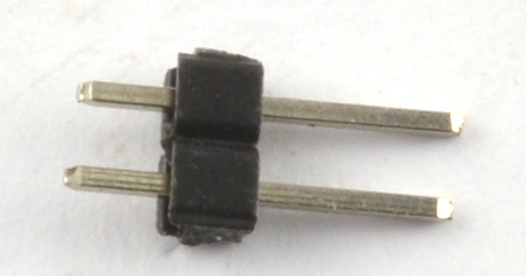 As long as the switch is not moved around too much, it should stay connected and make a reasonable contact, but soldering is better if you can. 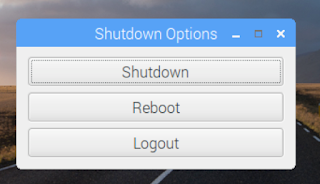 To test out your modification, power up your Raspberry Pi and then shut it down, by selecting Shutdown from the raspberry menu. Then select the option Shutdown. After a while the screen will close down and the Pi will go into a 'halt' mode, where it uses minimal power and is basically in standby mode. 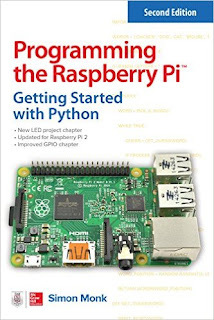 Now to start your Pi, all you need to do is press the button and it will start to boot up! 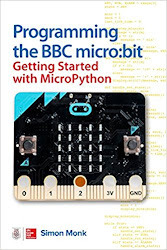 It would be nice to take it a step further and make it work via a remote. 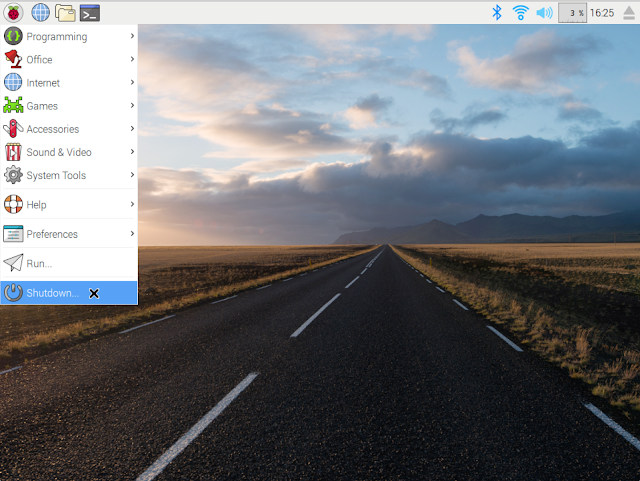 Perfect if you using your RasPi as a media centre. 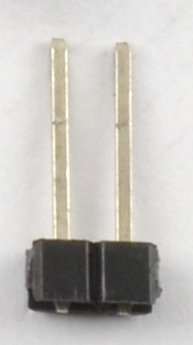 Can you recommend a place online where the 2 pin header can be purchased? Most electronic companies sell the headers. Usually in cut-able blocks. 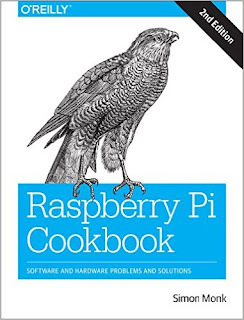 "When you gave finished using your Raspberry Pi, you should really shut it down, otherwise, its possible to corrupt the SD card image which would mean you having to reinstall Raspbian." Just for clarification, you mean a proper shutdown from the OS vs pulling the power, right? I've got several raspis which run 24/7 for months at a time. Even power loss is quite survivable, thanks to the ext4 filesystem. 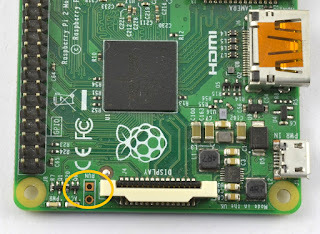 Still, very cool to know that it's easy to install a power switch in the raspi, thank you! As I understand it, this button is for starting up, but not shutting down? I run a headless Pi, shutting it down through SSH, but I would like the button push to send a proper shutdown command. I don't know if this is workable. Anyone know the answer? 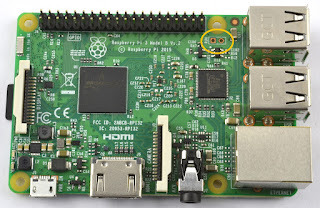 If you tap the button while the Pi is running, it will stop the CPU and cause the OS to reboot. 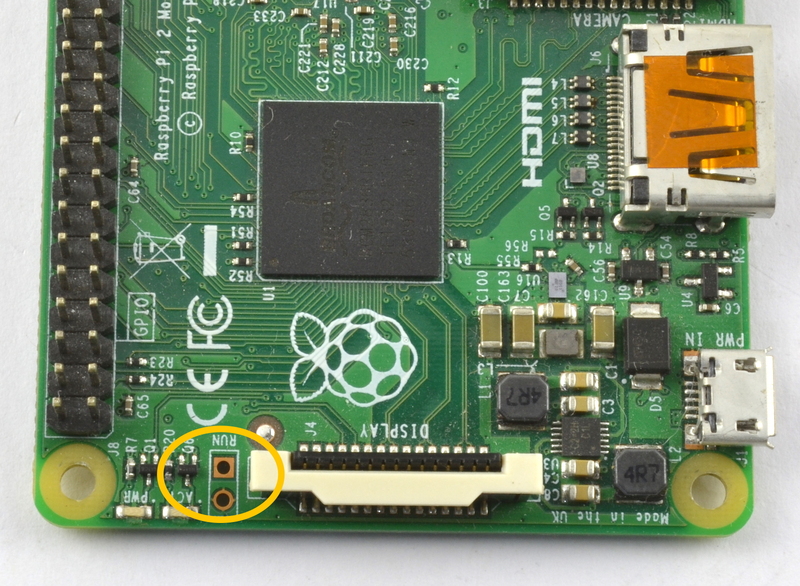 A better option maybe to pull pin GPIO.3 to ground to wake the CPU from a shutdown. Recent loader blobs monitor this pin after a soft shutdown.